20429 Vintage Berber Moroccan Kilim Rug Flatweave Rug 05’02 x 09’10 From Esmaili Rugs Collection. 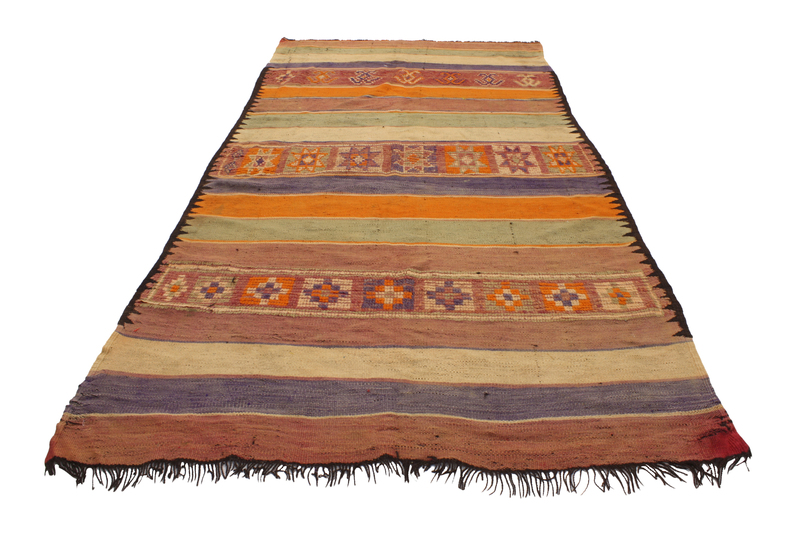 This vintage Berber Moroccan Kilim rug features a tribal boho chic style, yet it still reflects an understated appearance ideal for modern and contemporary interiors. A series of vibrant colored bands add intrigue and a casual design aesthetic. Rendered in variegated shades of rust, pale mint, beige, violet, muted raspberry and orange surrounded by a dark brown saw tooth border and fringe. 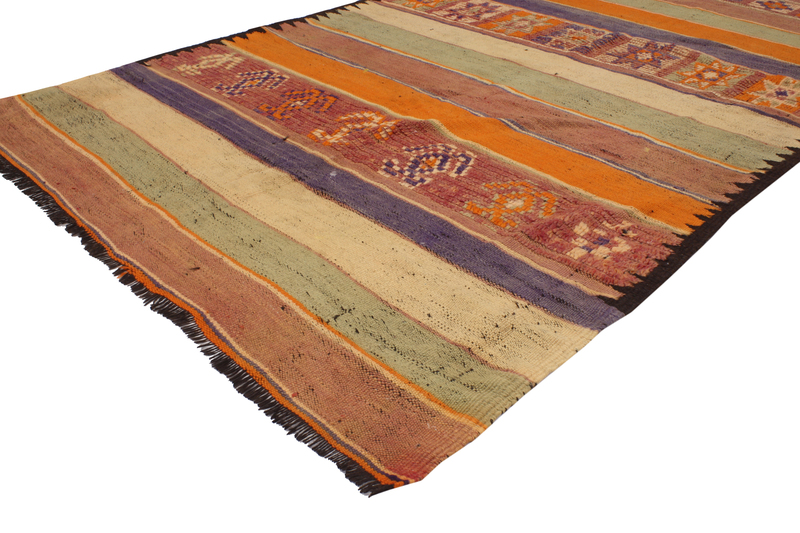 Kilims are not only found in the home, but also in offices where they take the edge off the usual formality. 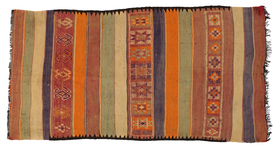 Discover the unique appeal of Kilims and incorporate these beautiful Primitive works of art into your home. Perfect for living room, bedroom, kitchen, home office, library, study, bathroom, wide hallway, foyer and entryway. Hand-woven wool. Hand-knotted wool. Carpet Runner. 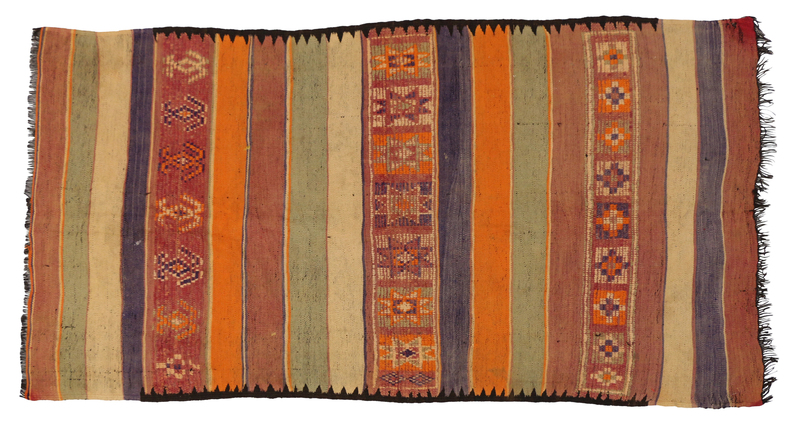 Flat-weave Kilim Rug with some pile. Made in Morocco. Berber Tribes of Morocco. Abrash. Measures: 05'02 x 09'10.